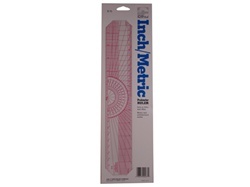 Beveled Protractor Ruler, 12" 15oz/doz 2" x 12"Transparent protractor ruler calibrated in scales of 16ths to the inch, centimeters, architects scale and 10ths to the inch. Plus 8ths and 10ths graph sections. Laminated for durability.